The Algerians will be looking to better some of their recent tournament performances in Brazil this summer. After finishing bottom of their group in South Africa in 2010 without scoring a goal and being eliminated early in the African Cup of Nations last year, Bosnian coach Vahid Halilodzic is under real pressure to deliver in Brazil. Like many of the other big African nations in qualifying, Algeria were given a bye straight into the second round of qualifiers. There they were placed into a tough looking Group H alongside Mali, Benin and Rwanda. They made light work of their group however, scoring 13 goals and only conceding four in their six games as they won it comfortably. The only blemish on their record was a late 2-1 reverse in Mali. Their comfortable winning of the group meant they moved onto the play-offs where they were pitted against a Burkina Faso side that is quickly rising to prominence in African football. Algeria progressed through on away goals but not after some controversy. They lost the first leg 3-2 in Burkina Faso because of a late and very contentious penalty before a Majid Bougherra goal scraped them through in a tough game at home. Still, they managed to get through to a second successive World Cup this summer. One of the few remaining veterans of the last World Cup, captain Bougherra is still the main man in defence for Algeria. Equally as comfortable on the ball as he is in the tackle, Bougherra’s ability to distribute the ball out of defence is key to Algeria’s attacking style. The former Rangers and Charlton man also has the incredibly handy knack of popping up with goals at vital moments. 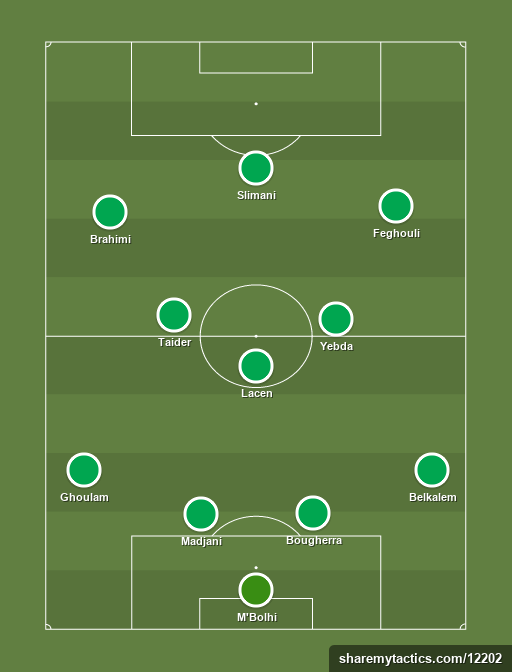 Bougherra will have to be at his best to help keep Algeria solid at the back in a tough Group H.
Brought into the fold at the start of World Cup qualification, Sporting Lisbon striker Slimani has quickly made himself the undisputed choice up front for Algeria. He scored five times in qualifying, making himself Algeria’s top scorer with only Asamoah Gyan, Mohamed Salah and Mohamed Aboutrika scoring more in the entire competition. Slimani is a natural goalscorer and with a goals to game ratio of exactly 1 in 2, he is quite prolific. Algeria will need to provide Slimani with quality chances to ensure that they can get the goals to qualify out of their group. A former French youth international, Valencia winger Feghouli typifies everything new and exciting about Algeria. Skillful and technically excellent, Feghouli is also versatile as he can play both through the middle or on the right hand side (where he spends much of his time at club level). He is a very creative player and serves as one of the main creative outlets for Algeria that they will look to to provide service for Slimani and the other forwards. Feghouli doesn’t just create and has a decent scoring record for someone who spends much of his time on the wing with 5 in 17 games for his country. Feghouli will have to be on song creatively if Algeria are to progress in Brazil. After their awful attempt at football in the last World Cup, Algeria are a completely different animal this time around. Utilising a high tempo 4-3-3, they are much more open and exciting to watch. The focal point of their attack is Slimani although El Arbi Soudani and Nabil Ghilas are excellent options there as well. He is flanked by La Liga stars Yacine Brahimi and Feghouli who will be looked at for creativity and excitement on the wings. The midfield trio is comprised of the exciting Saphir Taider of Internazionale who, along with Udinese’s Hassan Yebda, will look to try and create opportunities in the centre of the park. Getafe’s Mehdi Lacen provides the defensive cover in midfield and is called upon to stop opponents attacks before they become dangerous. He sits in front of a back four marshalled by Carl Madjani and Bougherra who have developed an excellent partnership and are both very good on the ball. They are aided by the exciting Faouzi Ghoulam at left back and Watford’s Essaid Belkalem at right back who will both be given licence to support the attack whenever they can. Rais M’Bolhi will continue as the undisputed number one in goals. Algeria sit in one of the hardest groups in this year’s tournament – Group H. They have three tough tests against Russia, Belgium and South Korea all of whom harbour hopes of progress this year. I think that Algeria’s game will be exciting and they will definitely score a goal this time but I don’t think they will get out of the group stage. I think that they will just finish bottom of the group after two draws with the Koreans and Russians and a narrow defeat to Belgium.